Some cemeteries in Maryland, Washington DC, and Virginia require flat bronze memorials and headstones instead of upright granite monuments. These beautifully cast bronze markers are installed onto granite bases, and then installed into a prepared foundation in the ground. 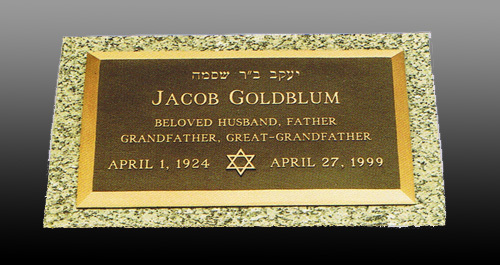 Bronze headstones are an elegant way to memorialize a loved one, by installing either at the foot or head of a grave site. 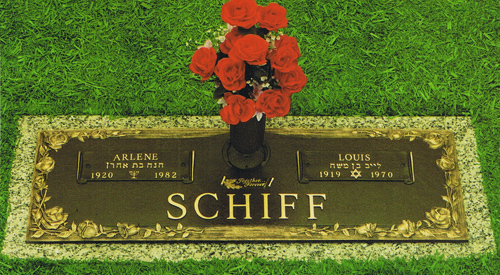 Bronze markers come in all shapes and sizes, and can be used as single, double, or family cemetery memorials. 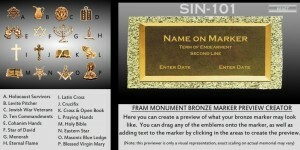 Warren Monument Company can match new bronze markers to already existing ones if desired, which includes: Matching size, border, background, fonts, spacing, and emblems. Before purchasing, Warren Monument Company will confirm whether your cemetery allows bronze markers, and if so, which styles, colors, sizes, and placements of markers are acceptable. 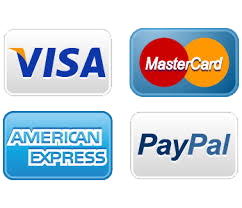 Below are just a few samples to give you an idea of the possibilities. 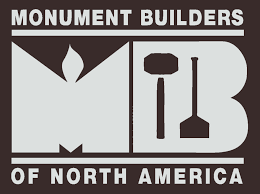 For other styles and sizes, please feel free to contact us, and one of our representatives will help to design the perfect bronze memorial marker.